It’s World Suicide Prevention Day today, Tuesday 10th September. The day, is an awareness day observed annually in order to provide worldwide commitment and action to prevent suicides. Regular visitors to the blog will know that I touch on the topic of mental health here the odd time, sometimes in relation to my own experiences, sometimes at a more general level, and occasionally referencing the influence of things like alcohol on our collective mental health. It’s great to see frank, open discussion of mental illness on social media and in the newspapers today; however in the course of the debate, we’re constantly hearing about “breaking down the stigma” as if it’s some big mystery. Stigma is born of ignorance and breeds fear, yet the reality is, each and every one of us has the key to breaking down that stigma, by just learning a little more about the nature of mental ill-health, and by taking small but meaningful steps to challenge it. Yes, you too. It’s not rocket science, and we can all do it. Some thoughts below. The key message we’re hearing is “If you’re in difficulty, talk to someone”. Sounds easy, doesn’t it? Just reach out, and everything will be okay. Well, you know what? It’s not that bloody easy. Firstly, when you’re in a place where you’re struggling, or convinced that no-one gives a damn about you, and that you might be better off dead, it’s incredibly difficult, nigh impossible, to reach out and talk to somebody. If you do reach out and talk to someone, you may not get the response you hope for, or need. What then? We need to stop placing the onus on people who are suffering to make that first move. This is a collective, worldwide responsibility. It starts with you and me, showing real human kindness to the people around us. Look around you, at your family and friends. If you think that someone is struggling, talk to them. Pick up the phone. Let them know you care. Even if they’re not visibly struggling, tell them anyway. It can be that simple. Telling people to “just talk about it” is all well and good. But in a country where we’ve been bred for generations not to talk about things, talking is something not something we’re all very good at. And if you’re the person chosen to talk to, you might have no idea how to handle it. If you do see someone struggling, and you’re not sure what to do or how to talk to them, that’s totally fine. It’s natural. We’re all human; we’re not all counsellors. Sometimes indicating that you’re willing to listen is all that’s needed. And if you need some help, the folks over at See Change have some very practical tips on how to talk and listen. And there are services available to help both you and the person in difficulty – you can call them yourself, pass the details on, or offer to accompany them while they seek help. We all have mental health, and we all have a responsibility to look after our own mental health. We are not victims of our minds. Prevention is better than cure, and there are countless things we can do to mind our minds. Exercise, fresh air, spending time with friends, eating well, taking a break from online activity, are all small steps that can have an incrementally positive effect on our own mental – and physical – health. Just like most physical ill-health, mental ill-health is not a permanent, unevolving state. Sometimes we’re in good mental health, sometimes, less so. That’s normal. For various reasons, people can go through difficult times where they struggle to cope. Depression can be all-consuming, and for the person experiencing it, it’s hard to believe that this feeling will every pass or that things will get better – but things can and do get better. Depression may be something that will always be part of your life – but it can be managed, in many different ways. Equally, if someone you know is experiencing depression now, with the correct help, there’s every chance they can and will recover. It’s heartening to see so many people sharing their experiences online. Sometimes writing things down is therapeutic, and reading those stories from people you might know is oddly reassuring. Let’s start taking the next step, and talking about it face-to-face, with our friends and family. It doesn’t always have to be a big deal. Experiencing mental health difficulties during life’s journey is perfectly normal, and a simple acknowledgement can go a long way. This was the thing I found hardest to do, but was the one helped me the most. While depression might always be a feature of my life, it doesn’t define me. I am far more than that. Depression can be managed. Proactively and reactively, there are things I can do to combat it. It’s not always easy to react, which is why I try to be proactive. Asking for help is not a sign of weakness. In fact, the very act of doing something about it made me feel stronger. “This too shall pass” became my motto For me, accepting that I wasn’t well was important, and sometimes I just needed to put my head down and let it pass, rather than fighting against it. Pass it did, and pass it will, if and when it happens again. These are lessons I learned on my own journey, but maybe they’re things than can help non-sufferers understand the nature of the illness and remove some of the mystery about it. Today is World Suicide Prevention Day. Preventing suicide isn’t something for “other people” to do. It’s up to you, and you, and you, and me. So do something. Pick up the phone, knock on that door, send that message. Speaking as one who knows, it could make all the difference. My friend died tragically a couple of months ago, he was going through a marriage break up, house sale etc…We have a card school that we play at each others houses once a month or so, nothing big, 20 euro or so and a cup of tea(no drink allowed).We were very aware of Alans situation but never noticed anything different. The day before(it happened) we had arranged a game for the following nite..Alan as per normal was first to accept the invitation…we never got to play the game. Ironic that tonight is the first game since he died….11 of us where there was 12 and do you know what we’ll mention him and laugh..but we won’t talk….Men don’t talk. Hiya Shane. I’m so sorry to hear about your friend. The frightening thing about suicide is that sometimes there aren’t signs that there is anything out of the ordinary. Sometimes, there is just nothing you could possibly have done over and above what you would normally do, which I guess makes it all the harder to deal with. Thinking of you and your friends tonight on what will be a difficult and bittersweet occasion. You might not be talking about it around the table, but I really hope you all have the support you need. Thanks for that Anne-Marie..have printed off your Blog will bring it tonight with me. If it just opened a door for one of the lads it would be like gold dust ! !Thanks again! Great piece. Just to add that for friends and relatives left behind,the trauma of losing someone to suicide can remain for many many years. We must also remember these people today and hope they find the help and support they need to cope with what is devastating and soul destroying experience for a lot of them. I truly believe that the pain of these people can be made positive by voicing it either through media or support groups to show persons thinking of suicide of the huge collateral damage caused by the suicide of just one single person. It is a wonderful life, we just need a real life guardian angle to get trough the not so wonderful times all of us to a greater or lesser extent must endure. Good Luck. Hi Austin. You’re right of course about the trauma and suffering of those left behind, and how important it is that they are supported afterwards. Thanks for reading. Yes and in Mayo it was a terrible stigma. In fact my grandfather committed suicide in the 1930’s and the trauma lived on in our childhood with the fear in our mother of speaking about it. The shame. Oh the shame. My mother never ever recovered and she is 84 now.The stigma was cast on the entire family like a cloud of black treacle and never allowed to lift. I learned there was no one in Ireland with the proper training and understanding to deal with those left behind. Sure its all talk but behind all the talk from Councillors etc is that underlying energy that those left behind can pick up.They know the Councillors etc do not have full understanding- its just words. My Dad died by suicide 11 years ago.We were close and yet I never knew he was feeling that way.There were no warning signs as far as I could tell and yet I still wonder did I miss something.A phone call 15 hours before and he was laughing and joking.Thats the hard part and the confusing part to this day.I’ve taken part in Darkness into Light for his memory and every little helps but a lot more to be done. Your piece has hit a chord and in a positive way Anne-Marie. Anne Marie, this truly is a great piece and while reading it, I’m thinking, who out there that I know might be feeling a little down today…..will be making a few calls ! Well written article stuffed with some great advice. Wish I’d read it two years ago before my best friend put a gun to his chest and pulled the trigger. He was seriously depressed but knew it and was having treatment – drugs, hospitalisation, the lot. He always promised us he’d never kill himself but he did! Two years on and I still can’t come to terms with it. 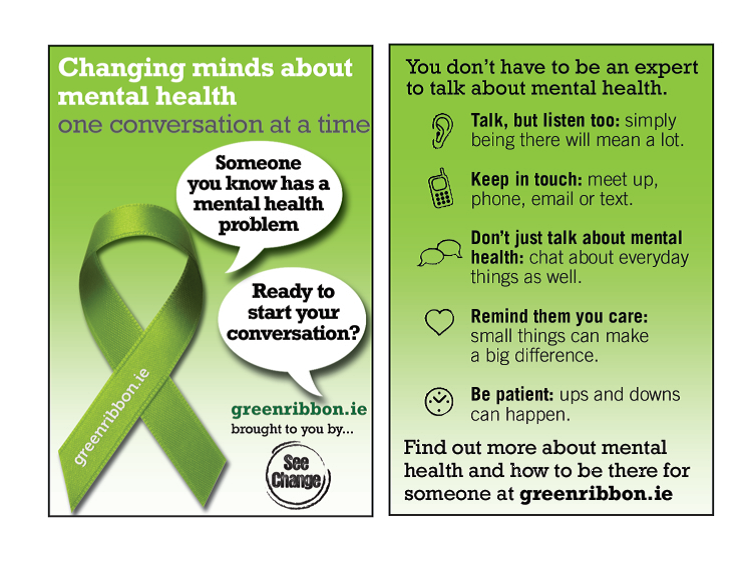 People need to talk – doesn’t cure the depression but it bloody helps! Pingback: PIERLUIGI GIANNI VECCHI » Thoughts about Art and Suicide Prevention.